Properties in Colorado Beach average 4.6 out of 5 stars. Property 18: Oceanfront, dog-friendly apartment w/ balcony & shared pool/gym/marina! 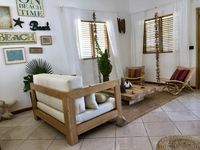 Property 20: Las Terrenas. Luxury New Property for 12 people maximum. Full service. Oceanfront Paradise, A dream vacation for less than a hotel. Property 28: Oceanfront Paradise, A dream vacation for less than a hotel. Property 34: Villa for 4 people with sea view. Property 45: Sea View Casita, Eco Sustentable. Green Projet! Las Galeras town is not that big, but the house was really nice, we've enjoyed our stay.